Hi, This is one more post on CRUD system in PHP. But in this tutorial We have made CRUD system by using Jquery Datatables plugin and Bootstrap Modals as front end tools and as back end script we have use PHP PDO Modal with Jquery and Ajax. In this post we have describe how to use Jquery Datatables plugin for Server-Side processing with PHP and Ajax. We have already made different CRUD Operation System in PHP. Here is some post in which we have already CRUD system by using PHP. You can also check demo online. We have also provide demo link with this post. We have already make CRUD Operation system in Codeigniter Framework also which you can find from above link. In this system User can Create or Insert new Data with Upload Image, Read or Fetch Data from table, Update or Edit data and Delete or Remove data. So in this System user can perform all CRUD Operation on single page without going to another page. So we can also called this Crud system to Single page CRUD System also. In our previous post we have already make CRUD system by using PHP PDO modal with Ajax JQuery. In that system for display data we have mainualy create table and display data in that table but in this system we have use Jquery Datatables plugin for displaying data on web page. In this system we have also add one more feature like user can also upload image with Inserting or updating of data. In this system we have use Ajax Jquery method with PHP PDO modal, So we can perform all CRUD Operation without refreshing of page and we can also upload image without refreshing of page also. For sending form data to server we have use Ajax FormData() Object, By using FormData() Object we have send form data to server via Ajax request. For making this system we have use JQuery Datatables plugin so we do want to write code for Searching table data, table column ordering, pagination and many more other features. JQuery Datatables plugin will automatically write code for this type of operation. We have use JQuery Datatables Server-Side Ajax processing for Insert Update Delete and Select of Data. 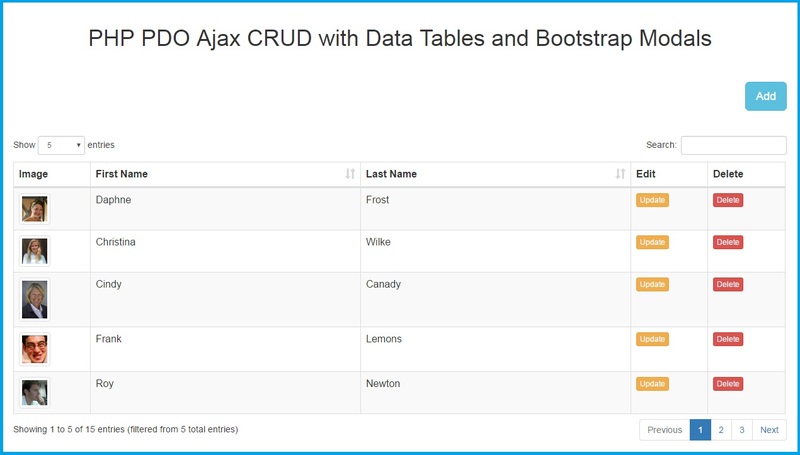 Jquery Datatables plugin is light weight plugin for table grid system. So we have use this plugin in our system. I hope this tutorial will help you to learning this system. If you have any query please comment your query in comment box. "DELETE FROM users WHERE id = :id"
great job that will help me a lot, there is just a problem with the sorting, you have to click on the conne "Last Name" to have the good alphabetical order in the column "first Name"
Thanks for tutorial, I am tested my server. Literally i like your website from heart and hope that keep on sharing this kind of stuff in the future also. Just a small issue i am facing, the column sort icons or images are missing with blank square shape, when i tried to run the script locally. Please advise, where to download this sort icons from and I guess i can store locally on root folder under images.